number in the history of the game. 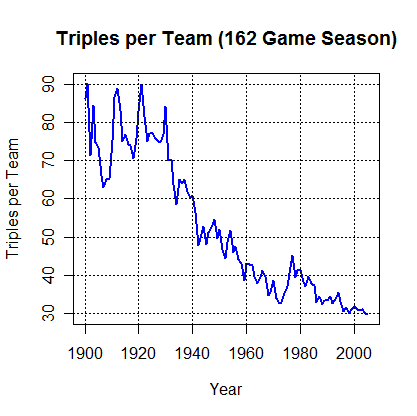 seasons to 162 games to put each year on equal footing. moment one aspect: ballpark dimensions. batters that were not all that fast. was 407 ft. (!) down the line in left and 421 in center. be driven in from second. games. His triples total, 96, was about half that of Collins’ total. more triples: 41 three-baggers for the Big Train. career. Kenny Lofton has joined him in the 100 Club with four triples already this year. guys are all about speed and not so much about power. triples in 2,266 PAs and Chone Figgins, 31 in 1604 PAs (through 2005). percentage, home runs and RBIs, as well as, naturally, triples. out his teammate and archrival, Ty Cobb, by just 14.
reading the book. Great stuff and Crawford’s chapter is the best of the lot. actually hit only 11 triples that year. So, per plate appearance, lefties hit about 40% more triples than righties. their turn to bat, usually get their share of triples. turf was installed in Candlestick Park in 1970 (and removed in 1978). speed, he has to be considered a terrible one. mentioned above: all batters with at least 1,000 plate appearances since 1970.
triples for Rickey, or about twice the number he actually had. about 79 career triples, still far short of the 130 predicted. was something in the water there in Oakland. shallow again. Friends, let’s save the triple! Retrosheet, as always, is the source of play-by-play data. 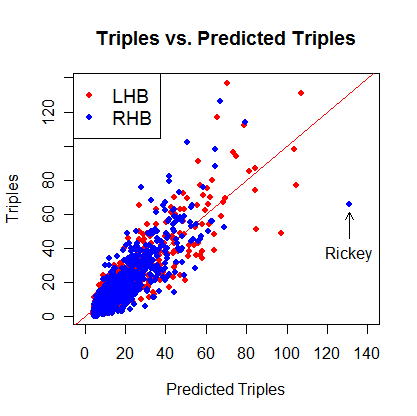 I also found the data used to estimate Rickey Henderson’s triples park factor at the Retrosheet site. of Their Times by Lawrence Ritter is not only one of my favorite baseball books of all time, it’s one of my favorite books period. And it cost less than ten bucks. The Great American Novel by Philip Roth. Maybe it’s not the great American novel, but it’s a great read nevertheless. Many references to real events in baseball (and American) history. Good stuff. A selection of Spalding’s Baseball Guides from the period 1889-1939 is available online. An invaluable tool for baseball research. Many thanks to Steve Treder, who provided valuable information on this subject.